I can't see the Download This Video button in Firefox, Edge, or Chrome. How can I download videos? Firefox users: The new version of the Firefox browser allows users to customize where the elements at the top of the browser appear. 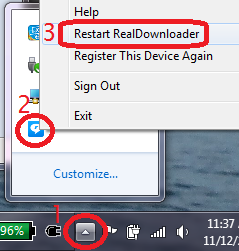 If you have customized your browser to move any other element (such as the search) to the left of the address bar (where you type in a URL), then the new Download This Video drop-down button will not find any videos to download. The solution is to move the address bar back to the left. - "Download This Video" works when browsing in Desktop Mode only, not Metro Mode. - If there is more than one user account on the PC that uses Download This Video, be sure to log out of the first user's account before logging into the second user's. If you "Switch user" instead of logging out, the Download This Video drop-down button will not appear for the second user.